Glotronoid lights up, but does not make sound like Lumitroid. It's ball form looks like a combination of Dual Hydranoid and Saurus. It was released in May/June with Splight, Merlix, Mystic Chancer, and Raptorix. Subterra Glotronoid has 750 Gs. 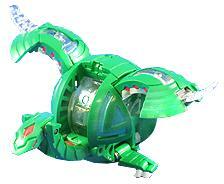 Purchase your Glotronoid Bakugan from Amazon now!